My windowsill is filled with orchids. The challenge is getting them to bloom. In February I watch for the first signs, small green stubs that grow into willowy stalks with nodding lanterns that will unfold into the aptly named moth orchids. I’m not organized enough to have proper labels on the pots and in late winter I wait for the buds to reveal the secret of their colors. Green velvet speckled with carmine, purple merlots, yellow-throated white ermine. All are eagerly anticipated. But then a stalk was broken. The buds had barely unfurled. Someone had carelessly brushed it aside. 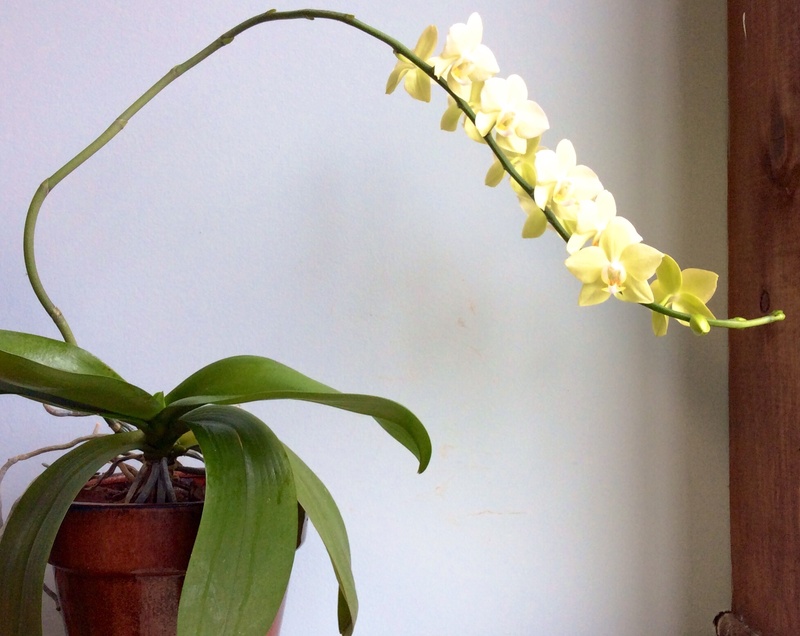 I hadn’t noticed the stem hanging by a thread and I debated–should I snip it off or leave it dangling? In either case the buds were withering. The next day I clipped it off, put it in a vase, and threw it away a few days later. Our relationships can be broken. We can be careless and may not notice the brokenness until the relationship withers. The relationship is discarded. Not too long ago, I received a call from someone I hadn’t heard from in many years. Our relationship had ended on a sour note a decade before. She had taken a chance in calling me and I took a chance in meeting her for coffee. We talked about our families, our art work, what new paths we were taking. A fresh start. What opportunities come my way to rekindle a relationship? How do I take a risk and begin anew? Am I missing opportunities to reconnect? Several months later when the orchids are dormant, a new shoot appears. 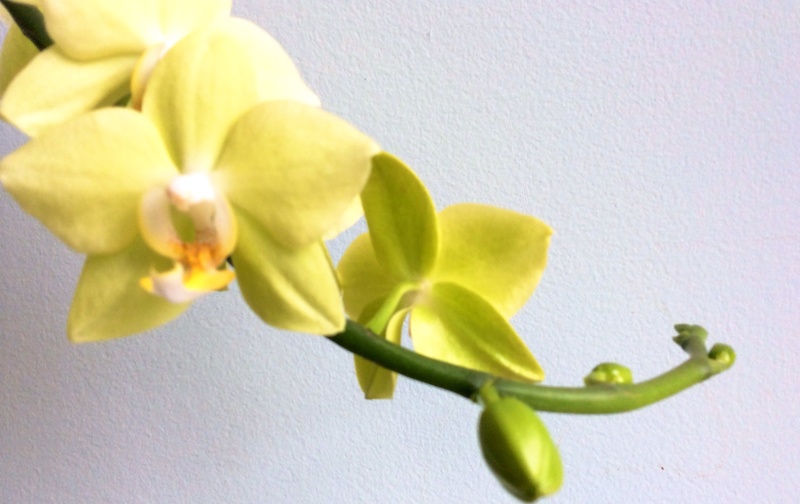 The damaged orchid flowers prolifically, with perfect flowers of Naples yellow dancing on the window ledge. When nurtured, broken relationships can bloom again.